If you are having trouble viewing this email, view our online version. To ensure you receive our email, please add IEEEService@ieee.org to your address book now. The latest issue of IEEE Systems Journal is in the mail and retrievable now from IEEE Xplore, the IEEE online digital library. All IEEE Systems Journal subscribers can access the online edition using their IEEE Account. "User Association in Massive MIMO HetNets"
"High-Dimensional CSI Acquisition in Massive MIMO: Sparsity-Inspired Approaches"
"DOA Estimation for Coherently Distributed Sources Considering Circular and Noncircular Signals in Massive MIMO Systems"
"Investigation of Transmission Schemes for Millimeter-Wave Massive MU-MIMO Systems"
"Energy Optimization With Dynamic Task Scheduling Mobile Cloud Computing"
"Cloud-Assisted Context-Aware Vehicular Cyber-Physical System for PHEVs in Smart Grid"
"Modeling and Analysis of the Thermal Properties Exhibited by Cyberphysical Data Centers"
The Systems Council currently has eleven active Distinguished Lecturers (DLs). The purpose of this program is to increase awareness about topics relevant to Systems Council by creating a pool of subject matter experts who are willing to speak to IEEE Chapters, Sections, Societies and Councils. To view the DLs, find out how to request a DL speech, or apply to become a DL, visit our website. A Chapter is a geographical sub-unit of an IEEE entity and is established by petition to the IEEE. Chapters are concerned with representing and fulfilling the needs of the member in their specific geographical area. Chapters allow members to meet face to face and host local activities. The Systems Council currently is looking to expand through the use of Chapters. Creating a Systems Council or Joint Chapter is easily done through a petition, submitted to IEEE. For more information on this process please visit the IEEE website or contact Marco Parvis, VP Member Services. View a list of current Systems Council Chapters on our website. The IEEE Systems Council Newsletter includes time sensitive news useful to its members, and highlights content from the current issue of IEEE Systems Journal. The IEEE Systems Conference recently took place in Montreal, Canada. All papers will soon be available in IEEE Xplore for us to read and think about. Vienna, Austria will be our next venue in Europe where the IEEE International Symposium on Systems Engineering will take place. Make sure we meet there in October! Other activities organized by the IEEE Systems Council are ongoing and this newsletter accounts for many of them. Keep in touch! View the full list of our Member Societies and Member Society Representatives. You are invited to submit relevant manuscripts for a special issue on "Human Cooperative Wearable Robotic Systems" in L-RA. Please visit their website for more details. Submission and Publication: All accepted papers in technical track will be published in IGESSC proceedings by IEEE. All submissions should be formatted according to the IEEE standard Word or Latex Template. IGESSC will also hold a one-day Workshop on 7 Nov with a hands-on session on realtime digital systems in the Power Systems Lab, and a presentation on green energy and power systems: choice, change, challenge, and opportunity. The 11th Annual IEEE International Systems Conference was held 24-27 April 2017 in Montreal, Canada. There were almost 200 attendees, one exhibitor, and over 100 presentations. The Welcome Reception and the Young Professionals Networking Event were both highlights of the social program. Join us next year for SysCon2018 in Vancouver, Canada on 23-26 April 2018! The 3rd Annual IEEE International Symposium on Systems Engineering will be held 11-13 October 2017 in Vienna, Austria. The theme includes Systems-of-systems, Systems Engineering, Systems Integration, and Systems Thinking. For more information, please visit the conference website. View the Call for Papers. Organized by the Miguel Hernandez University of Elche, Spain and the University of Houston, TX, USA, it will take place at the Hotel Balneario Las Arenas in Valencia, Spain. It seeks to unite thought-leaders and innovators acting at the intersection of the arts, neuroscience, engineering, media, industry, education and medicine to review the state of the art, identify challenges and opportunities for the field moving forward to promote creativity and innovation leading to novel approaches to solving complex challenges in engineering, science, education and medicine while informing the emergent field of neuroaesthetics. The conference will include a Hackathon sponsored by the IEEE Brain Initiative and a Special Issue in the journal Brain-Computer Interfaces. The provisional program is now available. IEEE is committed to excellence and the IEEE Systems Council Technical Committees (TC) are designed to flexibly respond to any engineering interests whether they be long or short term. To participate in one of the TCs, please contact Walt Downing, Vice President, Technical Operations for the Systems Council. Please view our website for more information. 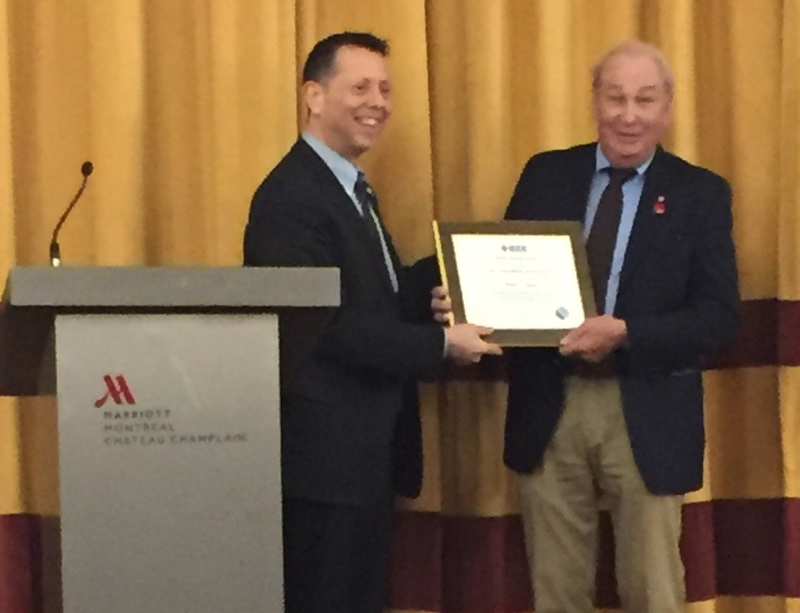 Congratulations to Bob Rassa, Director of Engineering Programs at Raytheon's Space and Airborne Systems and the Vice President of Conferences for the IEEE Systems Council. Rassa is the first recipient of the IEEE Systems Council Outstanding Service Award. This award honors long and distinguished service to the IEEE Systems Council at a level of dedication and achievement rarely demonstrated. The award was given at the 2017 IEEE International Systems Conference in Montreal, Canada. Congratulations to the IEEE Systems Council James O. Gray Scholarship recipients! This scholarship recognizes students pursuing studies in process control systems engineering, plant automation, or instrumentation and measurement. The Systems Council 2017 Spring AdCom was held in conjuction with the IEEE International Systems Conference in Montreal, Quebec, Canada. 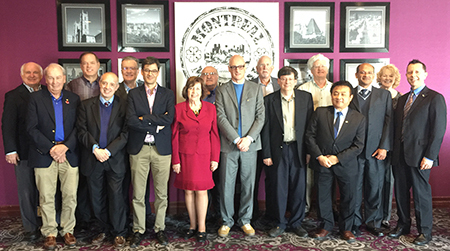 The meeting was held 27 April 2017. To see the full list of Systems Council Officers, please visit our website. IEEE is pleased to introduce a new IEEE data repository service called IEEE DataPort™. After gathering input from IEEE members and performing further research, IEEE DataPort was developed and is now LIVE and ready for use by all society members. IEEE DataPort provides many benefits to IEEE society members beyond what other data repository services can offer. Learn more about the valuable capabilities of IEEE DataPort and the key differentiators that set IEEE DataPort apart from other data repositories. IEEE DataPort is ramping up quickly with new users and new datasets. Visit the IEEE DataPort website and view the valuable capabilities it offers. Copyright 2017 IEEE - All rights reserved. Use of this newsletter site signifies your agreement to the IEEE Terms and Conditions. If you would like to be removed from this email distribution, please [Response: Unsubscribe from List]. If you have unsubscribed in error, please [Response: Subscribe to List]. To unsubscribe from all mailings, use your IEEE Account to update your "Personal Profile and Communication Preferences." Replies to this message will not reach IEEE. Due to local email service/provider settings, random characters may appear in some instances. Although the IEEE is pleased to offer the privilege of membership to individuals and groups in the OFAC embargoed countries, the IEEE cannot offer certain services to members from such countries. For more information or questions regarding your IEEE Membership or IEEE Account, please direct your inquiries to the IEEE Contact Center.